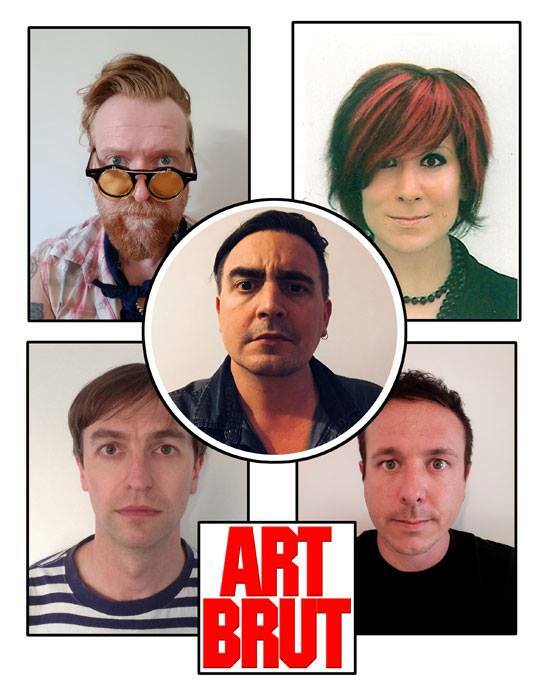 The Roar Club and Club Biscuit are delighted to be bringing one of their all time favourite bands, ART BRUT (Top of the Pops!) back to Bedford Esquires on Friday the 31st May 2019. Art Brut are one of those bands who bring people together, bizarrely not enough people to fill stadiums, but everyone remembers their first Art Brut gig. Describing themselves as ‘the sound of a man shouting over the top of some indie racket’, Art Brut are actually one of the best live acts of the past two decades and Eddie Argos is the finest frontman since Jarvis Cocker. There, I’ve said it. If you can’t relate to Eddie’s tales of obsessive teenage crushes, crippling hangovers and the power of a perfect pop song then we simply can’t be friends. Returning after a seven year absence with a new line up and a superb new album ‘Wham! Bang! Pow! Let’s Rock Out!’, this will be Art Brut’s third appearance at Esquires. Hopefully some of you will have formed a band since their last visit otherwise Eddie will be taking names. Tickets are £15 in advance, available from 10am on Friday the 12th of April from seetickets.com and shortly afterwards from Esquires Bar / Slide Record store.